We will open on Friday night and run Fridays and Saturdays through April 12th. Tickets are $18 and are available here. A haunting love triangle triggers an unexpected chain of events in this poetic world premiere play. In the early stages of a new relationship, Sarah and Sam are lovers happily discovering each other. Sarah and Nate know everything about each other, best of friends since childhood and maybe something more. But when Nate shows up unannounced on Sarah’s doorstep, she’s left questioning what and who she wants in this humorous and heartbreaking look at love, memory and the decisions that alter the course of our lives. The show runs 75 minutes with no intermission in the Thompson Shelterhouse Theatre through April 20th. Tickets are available here. 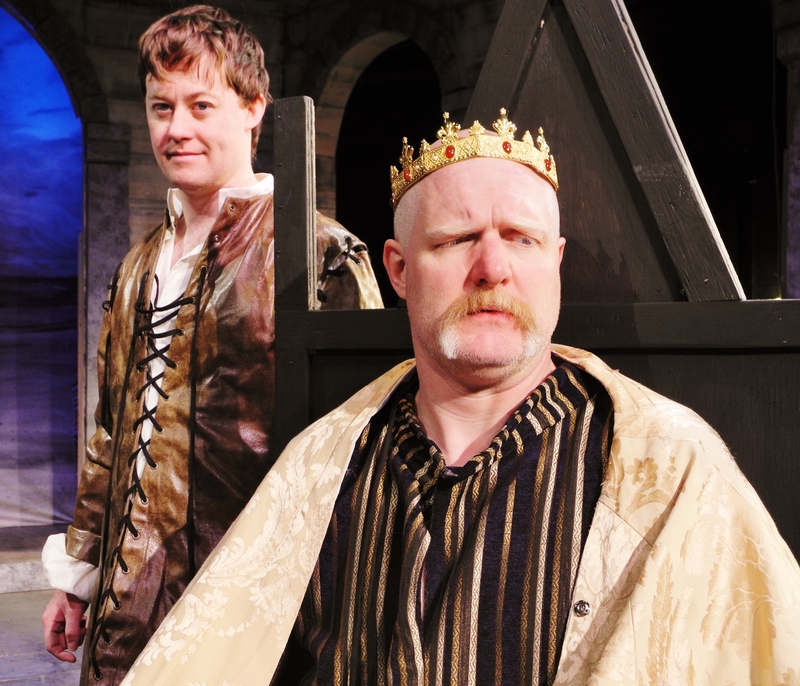 Justin McCombs as Prince Hal and Jim Hopkins as Henry IV and in Shakespeare’s “Henry IV: Parts 1 & 2” March 28- April 19, directed by Brian Isaac Phillips. Performances are located at CSC’s Theatre , 719 Race Street in downtown Cincinnati. Tickets are $22-35 and are available online at cincyshakes.com or by calling the box office 513.381.2273. Photo by Cal Harris. Opening on Friday is HENRY IV: PARTS ONE AND TWO at Cincinnati Shakespeare Company. After usurping the throne from King Richard II (Brent Vimtrup), King Henry IV (Jim Hopkins) finds he has inherited a country in chaos. Rebellions abound, lines are being drawn and one false step could plunge the country into civil war. To make matters worse, his son Hal (Justin McCombs) is now heir to the throne but has forsaken his duties at court and taken up with a band of brigands under the charge of that notorious drunkard and pot-bellied prankster, Sir John Falstaff (Matthew Lewis Johnson), one of Shakespeare’s most hilarious characters! HENRY IV runs through April 19th. More information, including a link for tickets is available here. Finally, don’t forget about OTHER DESERT CITIES at The Human Race Theatre in Dayton, Ohio. 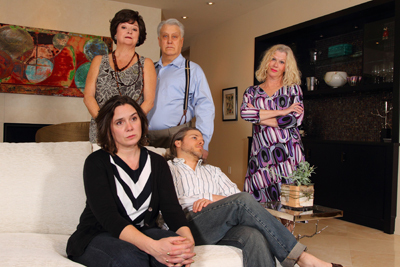 This family drama is a well-written contemporary look at politics and relationships in a media-driven, sensationalistic culture. I really enjoyed it when I saw it last year at Ensemble Theatre of Cincinnati and I’m very excited to see what Human Race does with the piece. You can read my interview with Jennifer Joplin, who plays Brooke Wyeth, here. The show runs opens on Thursday and runs through April 13th. I’ll see the matinee on April 6th. More information and tickets are available here. As always there are a ton of great theatrical opportunities this week in Cincinnati. Don’t forget about the beautiful PRIDE AND PREJUDICE at The Playhouse, the engrossing THE MOUNTAINTOP at Ensemble Theatre, and the sold out LES MISERABLES at Wright State (which I’ll see Sunday afternoon). Stay tuned this week for Cuckoo’s Nest features and we’ll also be profiling cast members from the upcoming AVENUE Q and Xavier University, Covedale’s GYPSY, and THE 25TH ANNUAL PUTNAM COUNTY SPELLING BEE at UC-CCM in the near future. It’s a great time to be a theatre lover in Cincinnati. So… what are you going to do to support local theatre this week? I’ll see you at the Falcon on Friday or Saturday.